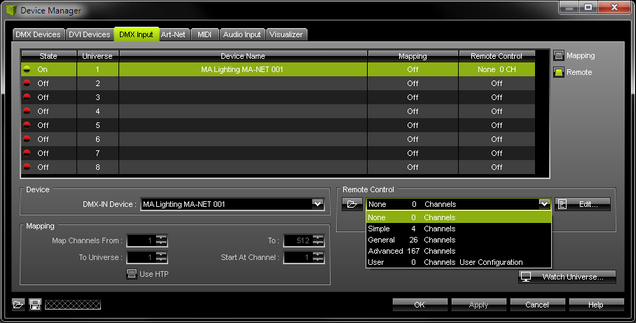 MA-Net from MA Lighting is a proprietary Ethernet network protocol. MADRIX supports it natively. 1] Set up networking for your MA product. 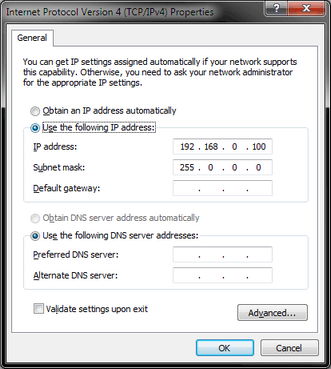 2] Set up the correct network settings in Windows. 3] Enable drivers in MADRIX. 5] Set up remote control. ▪ Make sure to connect your MA devices and the MADRIX computer in the same Ethernet network over network cabling [and possibly a network switch]! ▪ Consult the user manual of your MA product to set up the correct settings for MA-Net for your MA product. ▪ Start Networking for your MA product. MA-Net is a network-based protocol. MADRIX will use the network card of your computer to receive data. ▪ It is required to set up the correct network settings in Windows, first. ▪ You must use the correct IP address and Subnet mask settings. Otherwise, MA-Net might not work! ▪ The IP addresses of your computer and your MA-Net devices need to be different. ▪ Set up an individual IP address according to the IP address range of your MA product. - Make sure that the first, second, and third part of the IP address are the same. The fourth part must be different from your MA product. ▪ Restart MADRIX, if you have changed the network settings in Windows while MADRIX was running. ▪ Check the settings of the Windows Firewall. ▪ Choose the correct network/network card from the drop-down list. - Always make sure that you have selected the correct network. Otherwise, no data can be received. ▪ - Defines the protocol version. - Choose the correct MA-Net here [MA-Net 1 or MA-Net 2]. - MA-Net 1 is used by the grandMA1 series. - MA-Net 2 is used by the grandMA2 series. ▪ Session ID - Defines the session you want to work in. Choose the session you have set up in your MA product also here. ▪ Universes (Start / End) - Defines the universe or universe you wish to receive. - The default Start Universe is 1 and the default End Universe is 1, which means that one DMX universe will be received. ▪ Your devices are automatically activated. ▪ Input is automatically activated. ▪ Since MADRIX will receive data, the Frame Time and FPS [Frame Rate] are managed automatically by MADRIX. ▪ Select your preferred DMX Universe in the list. 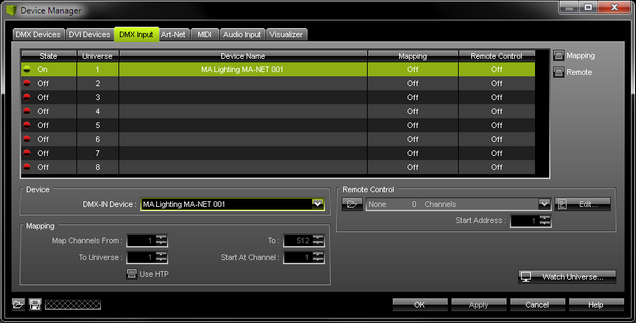 ▪ Select your DMX-IN Device in the section Device by choosing the MA Lighting MA-Net device. ▪ Make sure that your device is still selected in the list. Open - Loads a previously saved MADRIX DMX Remote Configuration file [of the file type *.mdrx]. Protocols - Choose from a pre-configured protocol [configuration]. DMX-IN Remote Editor - Allows you to modify a configuration or create a new configuration. Start Address - Defines on which particular DMX channel the protocol should start. The whole protocol will be mapped to this new address area. Watch Universe... - Appears when you have selected a list item. 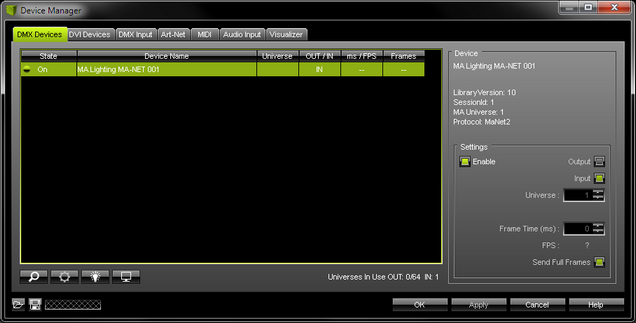 The DMX Watcher will open with the particular DMX Universe already entered. Mapping is not available for MA-Net and cannot be enabled. ▪ Always make sure to have a valid network card active! Otherwise, MADRIX cannot receive MA-Net [even when using MADRIX and MA on PC on the same computer]. ▪ Always make sure to have a valid license for your MA product to send out Ethernet data or use a console. ▪ Please make sure to save your MADRIX Setup file after the configuration process. ▪ Double-check the settings of your network card. 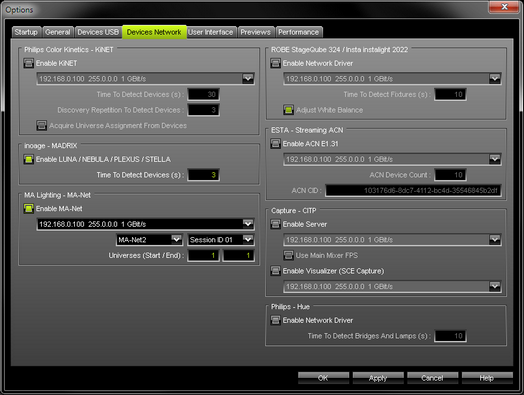 ▪ Double-check the settings of the MA-Net devices in MADRIX. ▪ Double-check the configuration of your MA product. ▪ Check if your MA product has a valid license to send out Ethernet data. ▪ Use the DMX Watcher to monitor incoming data.